She covered many aspects and causes of this problem, and I’d like to share some of her thoughts and ideas with you. Some of these I’ve never heard of or thought about before, so I found this information very valuable. When a parrot first begins pulling or mutilating its feathers, Dianalee strongly believes the bird should immediately be taken to a qualified avian veterinarian for a complete work-up, including a CBC, to rule out any possible medical problems. I have to agree. There are medical causes of feather plucking and with the tests that are available, they are the easiest causes to determine. It just makes sense to go this route first. Regular bathing is necessary for feather health, and a bird that has dirty feathers and/or dry itchy skin is more prone to plucking. This is especially true in areas of the country that experience a lack of humidity. Remember that in many areas, lack of humidity is a seasonal problem so if your bird tends to pluck only at certain times of the year, this is a cause you might want to consider. Frequent showers or baths may help alleviate or prevent feather disorder behaviors in parrots, especially if you live in an area where lack of humidity in the air is an issue. Using a humidifier during the dry times of the year may also help. There are several dietary considerations when discussing feather grooming disorders. One is the presence of salt in the diet. Removing any source of salt in the diet can be helpful. When plucking is seasonal, you may want to look into changes to the diet that are made based on the seasonal availability of certain foods that you perhaps aren’t even aware of. Finally, some parrot behavior consultants believe that the artificial colors and preservatives found in some parrot diets can contribute to feather grooming disorders. You may want to consider switching your bird to another diet; Dianalee specifically mentioned Harrison’s, which is made from organic ingredients (no pesticides or fertilizers) and has no artificial colors or preservatives. Dianalee recommends full spectrum lighting if your parrot does not have access to unfiltered sunlight (light coming through the windows in our homes is filtered). She also believes that seasonal lighting changes can contribute to feather grooming disorders. Mattie Sue Athan said much the same thing in her presentation on screaming. She states that the time of the year that she calls "Screaming Season" beings at the winter solstice (Dec 21st). One way to deal with this is to provide plenty of light in your home that goes on and off at regular times. Parrots sometimes pluck out of boredom. It is important to give your bird time out of its cage each day. It is also important that the bird receives interaction with the humans in its household on a daily basis. Teaching your bird that talking is an acceptable way to get your attention may help prevent or alleviate feather grooming disorders. In addition, make sure your parrot has plenty of toys to play with, with new toys rotated into the cage frequently. If your bird doesn’t play with its toys, you may have to teach it how. Another important consideration is that many parrots need items in its cage that can be chewed on and shredded. Dianalee suggests paper, paper towel rolls, leather and soft woods that bark that can be chewed off. In her presentation on screaming, Mattie Sue added that as soon as most of the bark has been removed, it is time to remove the limb or twig and replace it with a new one. She also suggested that a great way to attach limbs and twigs to a cage is with plastic cable or wire ties that can be found at a hardware or computer store. 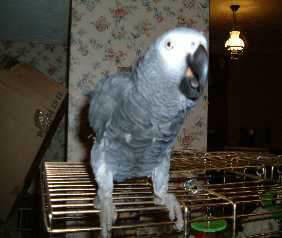 I have also found an inexpensive way to keep beaks busy is to use a holder such as one of those shish kabob hangers. Hang some dried pasta shapes (some shapes come with holes in them, perfect for hanging) and some chewy dried fruit. It’s best to dry your own and it’s very easy. Of course, the major benefit is that your dried fruit doesn’t contain any chemicals or preservatives that store-bought dried fruit often contains. And because the moisture has been removed, you can leave it in the cage for the day without being concerned about it spoiling. Some birds may feather pluck if they do not get enough rest. Make sure your bird is getting 10 to 12 hours of sleep each night. Some wing feather trims can cause a parrot to feather pick. One way this can occur is when the wing feathers are trimmed in such a way that it causes the trimmed feathers to poke into the sides of the bird and irritate that area. Another theory that Dianalee shared has to do with a bird exercising by flapping its wings. She believes that when a clipped bird flaps its wings, it expects and needs to feel a certain amount of resistance to the air. If it doesn’t, it can become frustrated and begin to feather pick as a result. She recommends a moderate wing feather trim as does Mattie Sue Athan. Click here for Mattie Sue's instructions. Dianalee also believes that our pet parrots need daily exercise, and she recommends getting them to flap their wings long enough to get them breathing heavily. This makes a lot of sense to me, and I plan to start this with my birds. I have done this as a fun game with my Quakers in the past but never on a regular basis. Here is how I do it. This can be done standing or sitting, although standing works the best for me. I have my Quaker perched on my index finger with my thumb gently but firmly placed over the toe facing forward on one foot. I hold the bird over my head and bring my arm down just fast enough to get my bird to flap its wings. I always precede this by asking my bird, "Wanna fly?" and pretty soon the bird will associate the phrase with the game. Also, if you laugh and have fun with it, your bird will enjoy it, too. I think it would be wonderful if breeders would teach their babies how to exercise in this manner and also educate their customers how to exercise their new bird. Dianalee also shared her thoughts on some of the common "remedies" for feather grooming dis orders. She does not believe in immediately collaring a bird when it begins to feather pluck. Drug therapies may be useful in the short term to break the feather picking cycle, especially if the bird is a rescue and has been abused. However, she does not recommend drug therapies for long term use. As far as homeopathic remedies, Dianalee has seen some success with these, but it is important to find the right formula. You may have to try more than one to find the one that helps. Again, this would be for short term and not long term use. Another idea that may help is giving the bird more control over its own life. One way to do this is to announce what you are about to do to or with the bird. Some examples include asking the bird to step-up to your finger, tell it you are giving it food or water, let is know you are about ti give it a bath or it’s time for bed. Another is to encourage the bird to talk and to learn to ask for what it wants. Of course, when it asks for what it wants, it’s important to reward that by giving the bird what it asked for. Sometimes stress and changes in the home can bring on an episode of feather plucking. I experienced this myself when my first Quaker, Alex, began to pull out her feathers during the time we were moving into a new home when she was 2 years of age. If you are experiencing stress or change in your life, be sure to take into consideration how it may be affecting your bird, and try to minimize it if possible. Dianalee also spoke about the value of having a surrogate family for your bird. If the bird is being affected by something going on in your home, removing it to another home for a while can be a solution. When your situation stabilizes, then the bird can return. I hope you find some of these suggestions helpful; I know I did. The Houston conference is the first I’ve attended, and I learned so much that is going to benefit my birds. If you have the chance to attend a parrot conference, I would highly encourage you to do so. I found the opportunity to learn more about my birds and to interact with other bird owners to be very valuable and worthwhile. I now plan to attend more conferences in the future.